I'm going to let you in on a little freelance secret: your very best clients are your past clients. Past clients will return to work with you again and again, and send new business your way. In fact, 80% of my own new business comes from referrals via past clients. But in order to get those referrals coming in, you have to have happy past clients (because no one is going to refer you if they didn't like working with you!). In the past few years of running my business, I've learned there are a few simple things you can do to make clients fall in love with you. When clients know what to expect, they feel confident in their decision to hire you, the process of the project, and where their money is going. This makes them happy and prevents unwelcome surprises for both of you throughout the project. You can outline a simple welcome packet (PDF) with details like your office hours, when and how they can contact you, estimated timeline for the project, and what you'll need from the client at each stage. When everyone's on the same page, everyone's happy. You'd be amazed at how a weekly Skype call or email outlining what's been done in the past week can make clients jump for joy. You'd also be amazed at how few freelancers do this. The number one complaint I hear from clients who have worked with other freelancers is that there was no communication and they didn't know what was going on. Schedule time in at the end of each week to either have a quick chat or send a summary email--your clients will love it! We all hope there are no mistakes on our projects--but they happen! Owning up to them and doing what you can to make them right goes a LONG way. After you've had your freak-out moment where you realized you screwed up, sit down, and brainstorm ways to fix the problem. Can't fix it? Offer a discount, additional service, or gift to make it right. After completing a project, nothing says you appreciate a client's business like a thank you. This can be as simple as a handwritten thank you card, or as fancy as a gift you know the client would love. This personal touch really makes clients feel special, and can be a really fun part of your business! I love stalking clients' Pinterest boards for gift ideas and surprising them with items off their wishlist. When the project ends, don't say goodbye! While it can vary by industry, I recommend following up with clients approximately a month after project completion to see how they are getting along. If they have a new website, are they able to update it easily? If they have new sales page copy, is it converting to more sales? Whatever your industry, reaching out and checking in on clients will show them that you really care. By letting clients know what to expect throughout the project, keeping them informed of the progress, owning up to mistakes, and ending with a thank you and follow-up, clients will recognize how much you care about their success and will fall in love with working with you! Happy clients lead to referrals, which lead to more business. It's a win-win situation for everyone involved. Erin E Flynn has been making websites since the dark ages of the internet (1999), and running her own web development business since 2012. A huge fan of streamlining and communication, Erin now helps coach new designers in simplifying their businesses and making more money. When she’s not glued to her computer screen, you can find Erin hiking, camping, or binge-watching Netflix. Find her online at erineflynn.com, take her course on how to follow up with past clients, or join the Unstoppable Crew to take control of your design business! I love marketing. In fact, I love any kind of planning! Since I started working on my business plans and strategies more purposefully, my business has grown by 150%. Seriously!! I've earned last year's income in just 4 months this year. I'm on track to earn a lot more than I planned for in my income planner earlier this year. That begs the question- how? What have I been doing that has increased my income so much? What plans have I put in place to grow my business so quickly? Do you need to plan the 'traditional' way? By traditional I mean long, boring, ugly plans that make no sense but feel necessary if you're going to call yourself a business owner. I don't believe you need those kinds of plans to build a successful biz. Freelancers these days waste so much time and energy creating 'professional' and 'traditional' plans and strategies like the ones we're taught about in business classes at school. But is that what we need? I don't personally think so. These plans feel professional and sophisticated because they're long and include lots of technical jargon, but if these kinds of plans don't help you make progress then toss them in the bin! Unless you're applying for a business loan and you're required to show your business plans to a bank, you can plan the easier way. I believe in a simpler way of planning. I believe in keeping plans SO simple that even a child can follow them. Because simple plans are the easiest to follow. Simple plans don't make our brains exasperated when we look at them- they're actually fun to tweak and use! When I first started my business I hated the idea of sales funnels; they sounded so boring and difficult. Besides, most of my work came through referrals so I didn't bother with many other marketing methods. But when I did some research, I realized that sales funnels are an organized and intentional way of marketing. Having a sales funnel in place is important because most leads don't purchase products or services the first time they land on your site; they usually have to go through each stage of your sales funnel. If you're a business owner then you need a sales funnel. Even bloggers need one if they want to create profitable blogs! You are only successful if you can continually get clients through your digital door, or continually make sales. When those things stop, your business fails. "I've gotten by so far on sheer luck... 100% referrals and word-of-mouth. But now I'm really looking to up my marketing and strategy." "I have a plan... but it has so many hurdles that I'm scared of it." One member called herself a 'wing-it' girl because she's gotten by so far by sheer luck. Heck, I used to be a 'wing-it' girl too! I would get by on referrals and client's who found me through social media. But the unsteadiness of that really unnerved me. I was balancing my entire livelihood on chance. Is that a sensible way of running a business? Heck no. Things had to change. I knew somewhere inside that if I didn't start getting purposeful with my plans, my business was going to hit a brick wall at some point and I was going to panic. I decided to take action one day by sitting down and actually creating plans. I used ugly, long templates that I got from Google but they just sat, unfinished, gathering dust on my Macbook. I then tried to make my plans more fun by creating bight, beautifully designed plans in Indesign. They were still really long through and they did the exact same thing as my other plans- they sat gathering dust on my Macbook. Eventually, I stumbled across Amber McCue's ebook 'Fresh Start 2015' and my life was totally transformed. Amber creates a digital planner each year filled with prompts and worksheets to help you plan for the next year. Amber's planner was great, but it was one of her worksheets that changed my view of planning. She gave away a business plan template with her book, and the template was a simple one-page spreadsheet. I couldn't get over the simplicity of it. I used it for the next 90 days and realized that I'd finally found the kind of plan I could stick to, the kind of plan I could actually enjoy using! 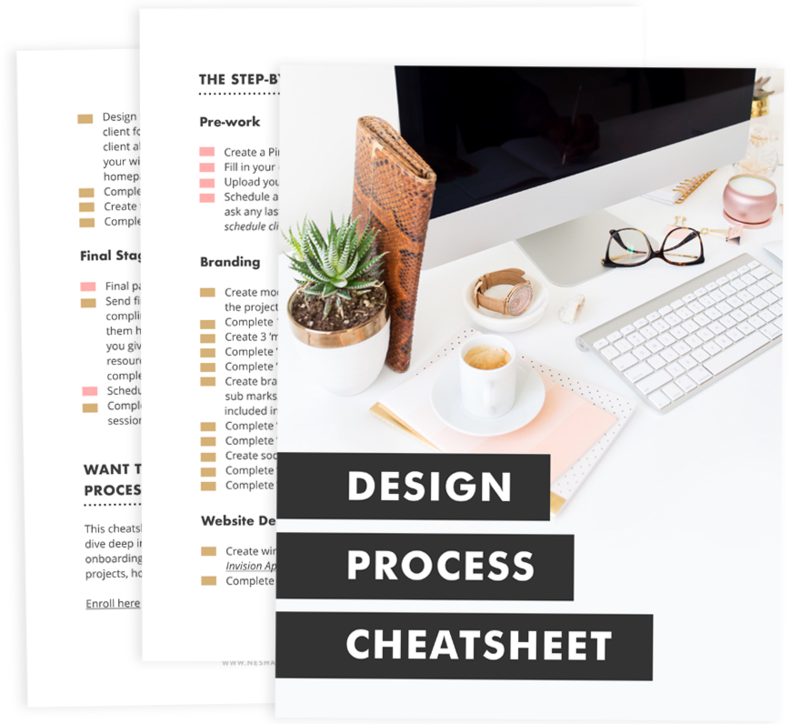 From then, I've only ever created simple one-page plans whenever I've needed to plan for something, whether it was a marketing plan, a business plan, launch plan or sales funnel. Keeping your plans short and simple stops your brain from feeling overwhelmed. So, how do you create a sales funnel? Watch the video above to see how I created my own sales funnel and how you can make one, too! Then click the button below to download my sales funnel template. What marketing methods should you focus on? As you can see in my video, a lot of the marketing methods I added to my sales funnel were video-based because one of my goals is to build more trust with my target market. Every business is different, so you may prefer to leave out video-based marketing and prioritize Twitter and Facebook. Whatever you choose, it isn't wrong. But don't be afraid to experiment with your marketing methods- add things to your sales funnel that push your boundaries a bit. 1. Add the question 'How did you find me?' to your website contact form. From now on, when potential clients fill it out you'll know how they found you. You may start to see a recurring pattern. If you do, make it a focus point in your marketing plan. 2. Ask past clients how they found you. If you need to know ASAP where to focus your marketing efforts, start by asking your past clients. Some may not remember, but it's worth asking. 3. Find out how others in your industry find their clients. Maybe you're new to the freelance world or you haven't had many clients yet. If so, find out where other people get their clients and customers from. It may be a little embarrassing or awkward, but just ask the question in a Facebook group or drop someone an email asking about it. You'd be surprised how many people will open up and share this info with you! I'd love to hear your thoughts on this subject (and on the video I created)! Post a comment below or post in our Facebook group and tell me: what is your biggest struggle when it comes to planning? As you probably already know, in July I decided to take my monthly posts one step further by sharing my goals, achievements, stats and growth each month. August didn't do as well as July but the reason for that is because I posted the social media schedule I create for TSC on my blog in July and it went viral on Pinterest, resulting in more hits to my site. But I'm still happy about my August traffic! It's a lot better than June, but I'm guessing that's because I've been putting more effort into my blog and I moved The Shelancers Club to this website. Most popular post published in August: 21 things you can automate in your creative business. The first article went viral on Twitter. My 'Mentions' tabs was constantly flooded with people tagging me in their tweet about that post, YAY. I think it's a well-known fact that posts and courses on automation and making business easier are always popular in the creative business industry, so if you have anything to say about this topic then I encourage you to publish a post on it! My second post was published in July and has had 1.2k shares on Pinterest so far. Seriously- where would my biz be without Pinterest?! I LOVE Pinterest. My top 3 referrers: Pinterest, Direct (people directly visiting my site), and Google. I don't really want to focus on my top 3 referrers today though, I want to focus on the 9th best referrer, Aeolidia. They featured one of my blog posts on their blog a few months ago and I get a small, constant stream of traffic from them every month. However, this month I booked a client who found me through them! I'll be sending them a postcard to say thanks at the end of this month. It just shows that even small sources of traffic can do wonders for your business! A 35-40% open rate is common in the blogging industry, but I'd like increase mine. I use Mailchimp and I have to pay for the amount of subscribers I have, so if people aren't reading my newsletters I'm going to delete them soon. To do this I just send an email to the people who don't open any of my newsletters and tell them I'll be unsubscribing them unless they click a certain link. My click rate is low, but that's because I don't require my readers to click through to my blog to read the full post. I just send the full post in the email. 1. Streamline my processes. I've been working on this goal for the past couple of months but I made major progress in August thanks to Stress Less & Impress, a course that helps freelancers streamline their process and implement systems. I was already doing a lot of the things outlined in the course but this course pushed me to improve them and gave me lots of extra ideas! It was definitely a great investment for my biz. 2. Fully book my schedule until I go to Thailand. I'm going to Thailand with some girl friends the end of October, so I wanted to book one final branding project before I go. Done! 3. Start adding content upgrades to my blog posts. Done- WOO! I signed up for Leadpages and I wrote and scheduled my posts for the next 3 weeks with content upgrades in them. I'm looking forward to seeing if my subscriber rate increases because of this in next month's September review! 1. Get 40 more TSC subscribers. This is a pretty low goal but that's the point. In the past, I've given myself high goals that I haven't achieved because they've seemed too distant. My aim here is that this goal will feel attainable and I won't feel the need to kill myself to attain it. 2. Book a design client for when I return from Thailand. I'm only going there for two weeks so I need a project lined up for when I return, hopefully a luxury brand + website design project. 3. Finish streamlining my processes. Can you believe I'm not done yet?! Streamlining and implementing processes is tough work, especially since I have lots of other jobs to do. It's totally worth it though. Since taking Stress Less & Impress my current systems have improved SO much! I seem more professional to my clients, everything is easier for them, and everything is easier for me! 1. I've learned the importance of keeping track of how much money I'm earning. Since I started using Wave I've realized I'm making more money than I anticipated, which means I've been able to increase my income goal for the year! 2. I'm sticking to my goals a lot better. Creating only 3 monthly goals has really helped me stay in control. I've found that when I focus on more than 3 goals, I stress out. 3. It's OK to hire help! I haven't hired a virtual assistant yet (because it kinda scares me) but I believe in doing things that scare you and I know I'll do this soon. It's just a matter of making sure I hire the right person. Stress Less & Impress*- the best course I've taken this year!! At first, I saw that I was already doing everything outlined in the course (like getting clients to sign a contract, fill in a questionnaire, use a project management system...) and I felt a little disappointed. But when I went through the course it showed me so many small ways I could improve what I was already doing. If you need to streamline your systems, or you haven't got any systems in place at all, definitely look into this course! Leadpages- I signed up so I could use their Leadboxes. It allows me to add an optin at the bottom of each blog post prompting my readers to sign up for a content upgrade, and it delivers the upgrade to them straight away and adds them to my mailing list. Viraltag*- I'm in LOVE with this social media scheduling tool. I use Buffer for scheduling to Facebook and Twitter but I use Viraltag for Pinterest. It allows me to really quickly bulk-schedule pins to Pinterest- a lot faster than I can in Buffer. Since Pinterest is my main source of website traffic, I've decided to invest $12 a month in Viraltag so I schedule regular daily pins. *Links marked with an asterisk are affiliate links. Don't worry though- I only promote products I've benefitted from and believe in. What have you achieved this month? What are your goals for next month? Leave a comment below this post OR post in our Facebook group!